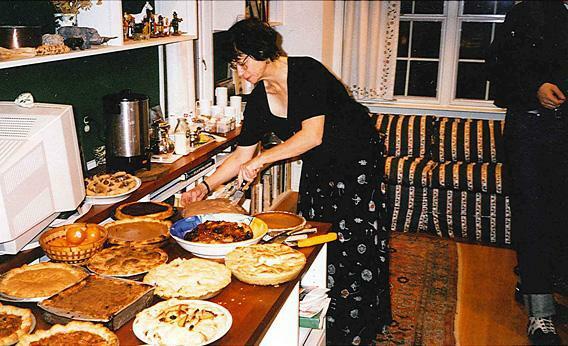 20 guests, 19 pies: My mother’s demented, glorious Thanksgiving baking extravaganza. At 5:15 p.m., after the turkey and trimmings, after the traditional neighborhood walk, after a few stolen moments of football watching, after the first round of washing dishes, we line up in the study. At first, it is an orderly line, children and older guests at the front, family in the back. The pies cover the entire desk, and spill over onto a bookshelf. Several are held in reserve—just in case. (In case of what, no one knows.) In recent years, they have been labeled carefully by the grandkids. The traditional pies are there, of course: a pumpkin, a pecan, several kinds of apple. The line jostles toward the cluster of creamy pies: lemon meringue, lemon cream, grasshopper, and, of course, mocha chocolate crunch (about which more below). In the far corner are the pies that only my father eats: mince, minty sly, ecclefechan tart, and funeral. The two flat golden pies, derby and frangipane, are impossible to tell apart. Hardest to reach, in the center of the table, are the experimental pies: pomegranate, coffee maple-walnut, and crab-apple pie with cider vinegar. Nineteen pies in all, for a Thanksgiving party of 20. The first cut is made, usually my mother dishing mocha chocolate crunch for a grandchild. And then, chaos. The line dissolves. It’s every piehole for himself, until, 45 minutes later, we all collapse, insentient, on the floor of the living room. My mother, a retired English professor, is a doting grandmother, a brilliant scholar, and a great wit. She is thrifty in her tastes—I can’t remember the last thing she bought for herself—and small of appetite. But in this one way she is extravagance itself. Her Thanksgiving pie spectacle—enough pie to feed 80 or 100 guests—is excessive, bizarre, and sometimes even grotesque. Yet it has also become the only holiday tradition that anyone in our family cares about. My children look forward to pie for weeks. We have friends who once rejiggered their holiday plans just to drop by for Thanksgiving dessert. My own favorite few minutes of the year are the ones just before the slicing begins, when I reconnoiter the pie room, and plan my assault. Apricot this year? Or the new apple crumb pie? A huge slice of cherry or just a sliver? And then, after the bloodbath, comes an even nicer ritual: the redistribution of the leftovers. It’s the best geometry class ever—how to fairly divide the remaining Pac-Mans of pie. This is when my mother is happiest. Her Thanksgiving always welcomes in strays—the Chinese scientist and his family, the Russian Fulbright scholar. Nothing delights her more than sending them home with a slice (or several) of America. What better introduction to the United States for my father’s new Indian colleague than a wedge of apple pie? The whole scene is enough to make a pie-lover out of the most hard-hearted pie skeptic! Like most family traditions, the pie indulgence began with a mother-in-law. For most of my childhood, we schlepped from D.C. to Brooklyn to spend Thanksgiving with my father’s mother. When she grew frailer in the mid-1980s, and when my brother went off to college, my mother gently inherited Thanksgiving. “I thought: If I am going to persuade the family to come here, it has got to have symbolic heft to it. There has to be a reason for the family to come here.” Always an enthusiastic baker, my mother began adding extra pies to the traditional Thanksgiving lineup. Ma is catholic in her definition of pie. She bakes plenty of two-crusted fruit pies, classic chiffon pies, and European tartes. But she has been known to turn cookies into pies, or serve crustless pies, or even make a pie that is more like a cake. If it can live in a pie dish, it’s a pie. (Click here for a list of the 51 kinds of pie she remembers having made for Thanksgiving.) Occasionally, Ma will rebel entirely, take a classic Thanksgiving pie that no one actually likes and transform it into something else. This year, for example, she vows there will be no pumpkin pie, only pumpkin bread. Oddly, our family eats only modest amounts of pie the rest of the year. My mother will bake a blueberry or cherry pie in the height of summer, and the occasional fall apple pie. I will do the same. But most of these pies, especially the favorite ones, we eat only once a year. Even the mocha chocolate crunch pie, a pie so incredible that Slate published the recipe in order to preserve it for future generations, is served only on this day. My daughter once disrupted the natural order of things by requesting mocha pie as her birthday cake. It was, of course, delicious. But it wasn’t delicious the way it is on Thanksgiving, when it also tastes like tradition. Our 8-year-old son announced last week that he wanted to bake pies—experimental pies—for Thanksgiving. So he and I will be baking a pie perhaps never attempted before, one conjured out of his feverish little brain: fruit salad pie. It could be disastrous. It could be great. Either way, it will take a place of honor on the desk in the study. As for our 3-year old son, he still prefers ice cream.